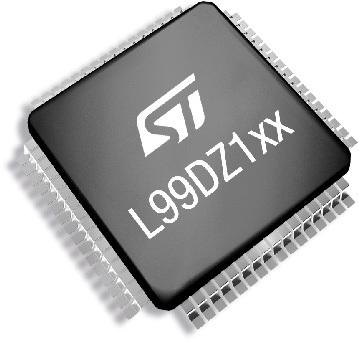 STMicroelectronics (ST) has launched automotive door-zone controllers featuring CAN high-speed transceiver with selective wake-up functionality. ST’s actuator drivers are designed for automotive door-module applications. The intergrade circuits (IC) employ a scalable actuator-driving concept, which includes package and software compatibility with the wide variety of door electronics used by the automotive industry. They support all regular door-module loads such as window lifting, lock motors, mirror leveling, mirror retraction, defrosters, and several lighting functions from incandescent bulbs to LEDs. For high-end cars, an electro-chromic mirror glass control unit is available. The L99DZ100G/GP is suitable for front-door applications and the L99DZ120 for rear-door controls. The monolithic chips feature power-management and failsafe demands in door-zone applications. They include embedded half-bridge and high-side drivers up to current ratings of 7,5 A. Additionally, they implement high-speed CAN (ISO 11898-2:2006) and LIN 2.2a (SAE J 2602) transceivers. The CAN transceiver on the L99DZ100GP complies with ISO 11898-6 (selective wake-up). This maximizes energy savings by allowing infrequently-used ECUs (electronic control unit) to remain powered down while connected to the CAN network. Both front-door chip variants integrate Mosfet half-bridges for driving up to five DC motors and can also drive an external H-bridge. In addition, there are eight LED drivers and a further two drivers for bulbs, a gate driver for a mirror heater, and a control module for electro-chrome glass. Voltage regulators for external circuitry such as a micro-controller and sensors, as well as associated timers, watchdogs, reset generators, and protection are also provided. The L99DZ120 contains similar features, tailored to requirements for rear doors, including motor drivers for electric windows.